One of the largest growing concerns in the Milwaukee and now, Green Bay areas are bed bugs. It’s common for people to assume that because they keep an orderly house or place of business that they are not at risk of bed bug infestation. However, anyone can be at risk due to how bed bugs spread. Anyone who comes into contact with bed bugs whether at home, or away from home, and who then interacts with the public is at risk for spreading bed bugs. Examples of where bed bugs might be found and potentially spread via your clothes or body include: on a bus seat, at a school or even from movie theater seating. Give any purchase of second hand furniture careful consideration because these items are often the single most bed bug contaminated objects. Many times people assume you can’t get rid of bed bugs. However, this is not true. 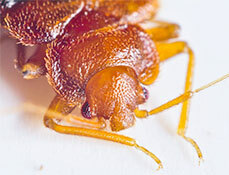 Full elimination of a bed bug infestation is completely possible. You can greatly reduce health risks of bed bug contamination and damage by acting quickly. The first step is to contact me immediately and then begin preparing for the visit by following the steps listed above in the bed bug pre-treatment checklist.